A Laura Poitras’ film about NSA whistleblower Edward Snowden has won Hollywood’s highest accolade by snatching the Oscar for Best Documentary. “The disclosures of Edward Snowden don’t only expose a threat to our privacy but to our democracy itself," Poitras said during her acceptance speech. "When the most important decisions being made affecting all of us are made in secret, we lose our ability to check the powers that control," she pointed out, thanking Edward Snowden "for his courage, and for the many other whistleblowers." Poitras added that she is sharing the award with Glenn Greenwald and "other journalists who are exposing truth." She was joined on stage by editor Mathilde Bonnefoy, producer Dirk Wilutzky and Snowden’s girlfriend, Lindsay Mills. As the filmmaker and her collaborators walked offstage on Sunday night, Oscar host Neil Patrick Harris couldn't help quipping: "The subject of 'CitizenFour,' Edward Snowden, could not be here tonight for some treason." “When Laura Poitras asked me if she could film our encounters, I was extremely reluctant. I’m grateful that I allowed her to persuade me. The result is a brave and brilliant film that deserves the honor and recognition it has received." “My hope is that this award will encourage more people to see the film and be inspired by its message that ordinary citizens, working together, can change the world,” Snowden said. 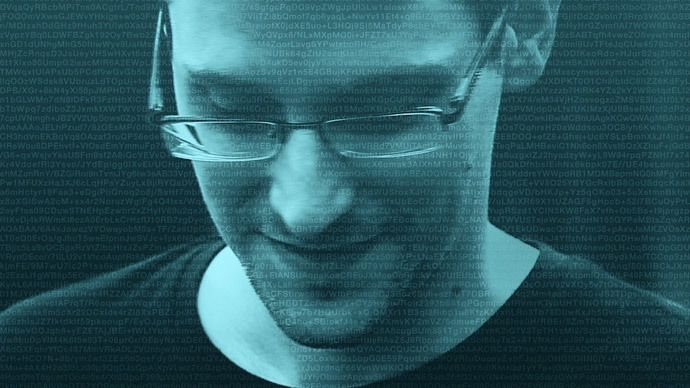 The documentary features a series of face-to-face meetings between Berlin-based filmmaker Laura Poitras, who appeared to be on the US Homeland Security “watch list” at one point, and the whistleblower Snowden, who got in touch with Poitras last January when she was working on a feature about surveillance in the post-9/11 era. "Every border you cross, every purchase you make, every call you dial is in the hands of a system whose reach is unlimited but whose safeguards are not," Edward Snowden warns in the documentary’s trailer. In 2013, after several months of encrypted correspondence, Poitras came to Hong Kong to meet the leaker. Her camera captured "Citizenfour", aka Snowden, in a hotel room, over the "eight days that shook the world," during which his astounding revelations were first made public in June. She told Vanity Fair that before she was contacted by Snowden she was "stopped and detained every time she crossed the US border" for six years running. She finally decided to move to Berlin. Poitras said she initially expected Snowden to be an anonymous source she would never get to meet in the flesh, and was highly surprised when he said they could meet face-to-face. "Citizenfour" was a shoo-in for the documentary category. In the last few months it has scooped a string of coveted awards, including best documentary at the Baftas, the prestigious Directors Guild Award (the DGA), and the National Society of Film Critics. Citizenfour beat out "Finding Vivian Maier", "Last Days in Vietnam", "The Salt of the Earth", and "Virunga" to grab the Oscar. At last year's awards ceremony, "Twenty Feet From Stardom" took home the top honor. "Citizenfour" is the final piece of Poitras' trilogy that began with an Oscar-nominee "My Country, My Country", about life and elections in Iraq during US occupation, and "The Oath", about Guantanamo Bay. Poitras shared a Pulitzer Prize last year for her role in publicizing the Snowden documents. She was also awarded IDA's Courage Under Fire award in 2013 for her "conspicuous bravery in the pursuit of truth." In December, Edward Snowden received a Swedish-based alternative to the Nobel Prize, the Right Livelihood Award, for "his courage and skill in revealing the unprecedented extent of state surveillance violating basic democratic processes and constitutional rights." Snowden has inspired another US director, veteran filmmaker Oliver Stone, to turn his story into fiction. Stone has purchased the rights to both “The Snowden Files,” a 2014 book about the NSA leaks written by Guardian journalist Luke Harding, and “Time of the Octopus,” a novel based loosely on the Snowden saga penned by the former contractor’s Russian lawyer, Anatoly Kucherena. Shooting is set to take place in Munich this year.